Elk steak is a delicacy that most people only have the pleasure of trying if they go to a fancy restaurant or hunt it themselves. It is typically not carried in your local grocery store so getting your hands on it can be quite difficult. However, if you are lucky enough to get your hands on some elk, this recipe will help you prepare a delicious and succulent elk steak. Try the recipe below and we guarantee you will want to bookmark this page to try it again. In order to prevent your elk steaks from drying out on the smoker, start by preparing a marinade to soak your elk steaks in for at least 6 hours or as long as 24 before you want to smoke them. The longer you let the elk steaks marinade the more moist and flavorful they will turn out. The ingredients in this recipe will serve as the marinade as well as the topping once you pull it off the smoker. 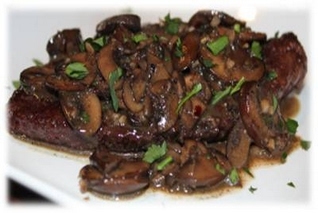 Combine your sliced Portobello mushrooms, minced garlic, onion, red wine, beef broth, butter, olive oil and salt and pepper. Bring the mixture to a boil over the stove over medium heat. Once boiling, turn to low and let the mixture simmer for 5-10 minutes over low heat. Take your marinade off the heat and let it cool down to room temperature. Mix your steaks with the marinade in a gallon zip-lock or a casserole dish and refrigerate for at least 6 hours. Once your steaks are done marinating, fire up your smoker to 225 degrees and then put your smoker wood on. Do not discard your marinade. Put it in the refrigerator for now as it will be reheated to serve as the elk steak topping once it is done on the smoker. Smoke your elk steaks for about 2 hours. You will want to cook the steak to about medium-rare or medium, as the more you smoke the elk steak the more it will dry out and loose flavor. Your elk steaks should reach an internal temperature of about 140 degrees. Once you pull your elk steaks off the smoker, cover them with foil for 15 minutes to let the meat rest and the juices distribute throughout the steaks. During this 15 minute waiting time, reheat your marinade sauce back to a boil over medium heat and then serve as a topping by pouring it directly over your steaks.